It’s people like Debs Torr and Chris Dobson who make the world a better place. Mr.’s Torr and Dobson are students at the University of East Anglia (UEA) – a world-renowned research institution in Norwich, England. According to them, their plan will save about 720 million liters (187 gallons) of water every year. Their radical idea? Pee in the shower. The name of their movement? ‘Go with the Flow.’ Something that many people appear to be doing: according to a survey by Angie’s List, about 80 percent of us tinkle in the tub. It’s understandable as to why 20 percent of us are reluctant. Peeing where you rinse and repeat doesn’t sound very hygienic (it is!). Others worry about urine staining their shower space. Now that we know peeing in the shower helps the planet, let’s talk about some other benefits. It’s cleaner – or at least as clean – to pee in the shower as it is the toilet. While a communal shower may be considered off-limits for many, your own shower serves as a hygienic second option. When it comes right down to it, your pee is going to backsplash anyways – might as well do it where you can rinse it off. If you’re like most of us, you pay a water bill. While probably not the most expensive utility, you’ll probably save a few bucks by going in the shower going a while. Most manufactured toilets use between 1.5 to 3 gallons of water with every flush. Older toilets are even worse, using 5 to 7 gallons every time. Women have to use toilet paper every time they hit the john. By taking a tinkle in the shower, you don’t have to wipe, only rinse. Besides saving time and money, it’s more hygienic for females. The United States Army instructs soldiers to urinate on their feet when out in the field. Why? Because urine is a natural antibacterial and anti-fungal treatment. Urine is also a good antiseptic – and urinating on a wound can help disinfect it; a practice that goes back to ancient times. Oh, and peeing in the shower feels good. The warm water from the shower relaxes your bowels and urinary tract enough to make the experience pleasurable. Yeah! 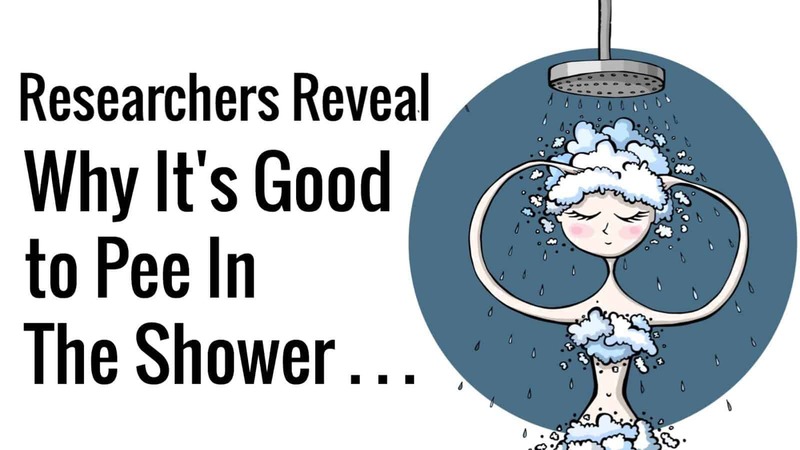 It’s your shower, after all (we hope.) Give that inner rebel of yours a reason to get fired up by doing something that “society” considers “unclean.” You can gain an extra bit of satisfaction knowing that the traitors who rail against shower pee are probably doing it too.